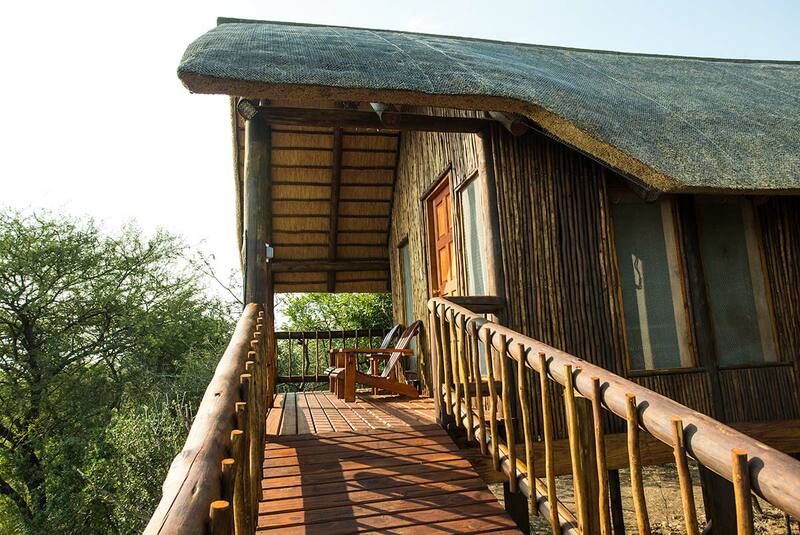 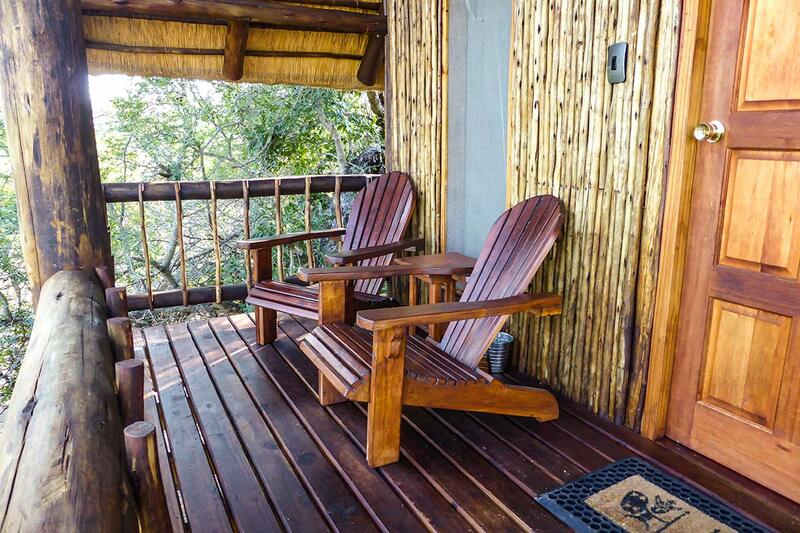 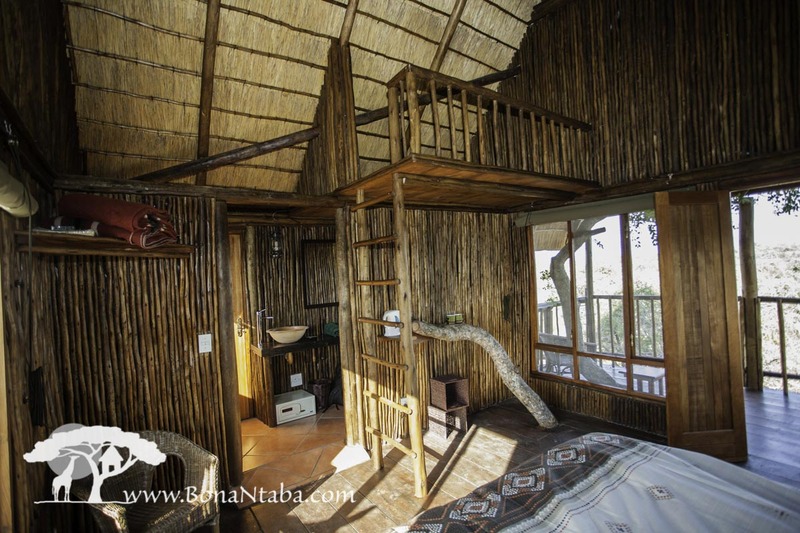 Our thatched roofed Family Treehouse is elevated to afford the best view of the the mountains from a private covered balcony. 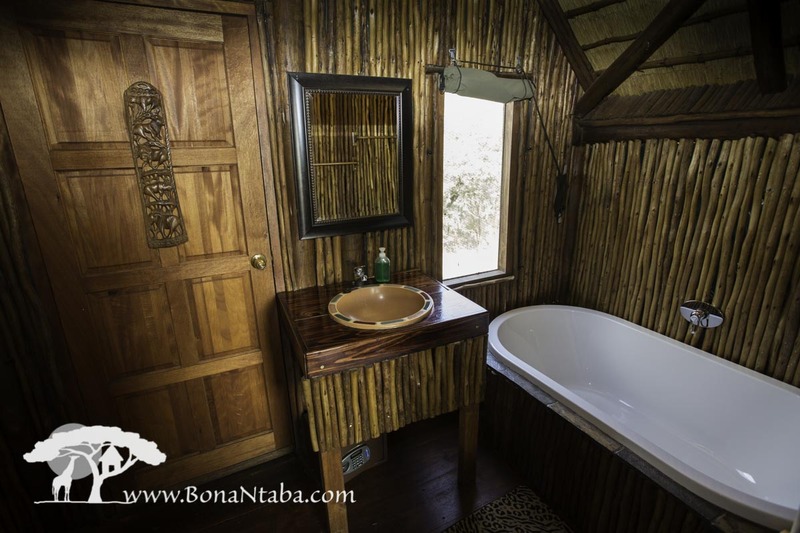 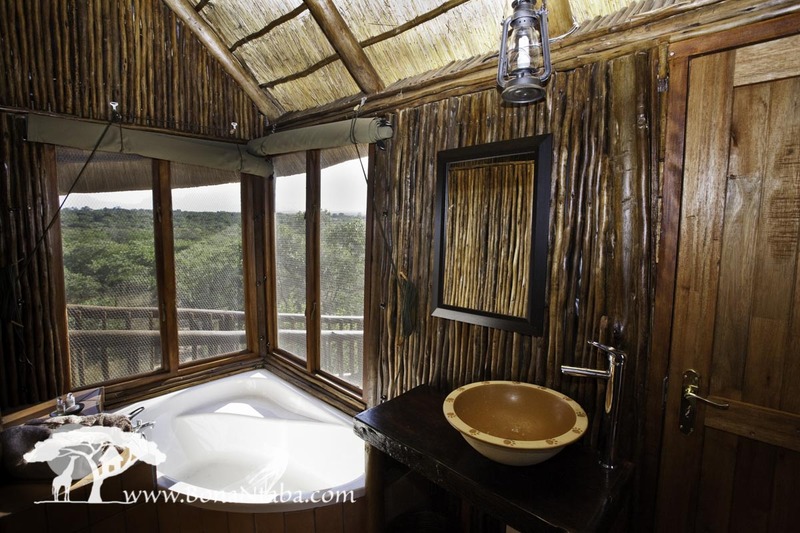 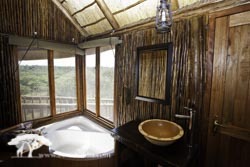 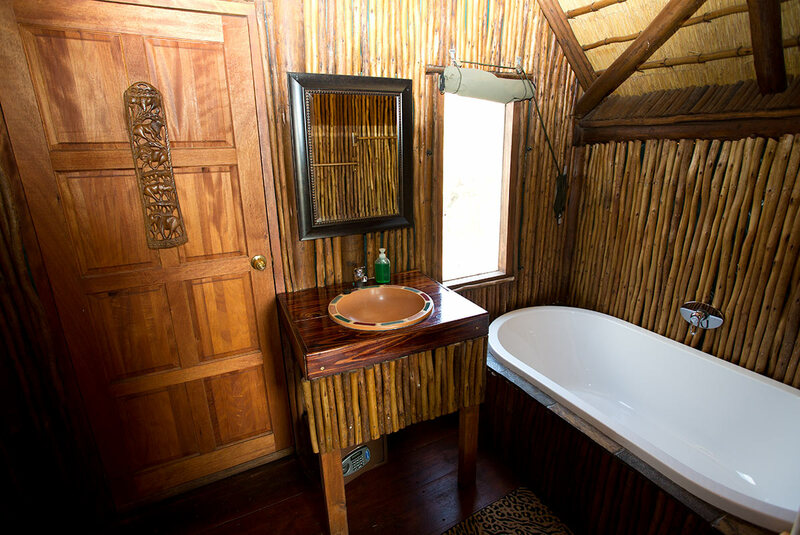 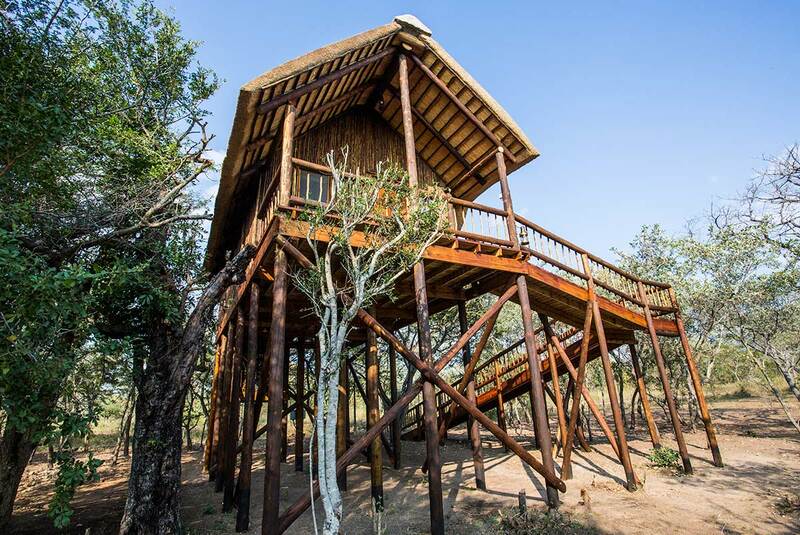 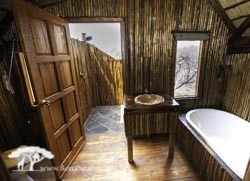 The tree house has an ensuite with tub, sink, and toilet inside and an outside shower with breathtaking views of the bush. 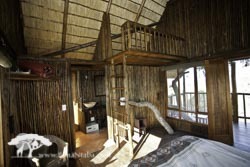 A loft is large enough to sleep two children; *perfect for children old enough to climb the ladder* (aged 8 and up). 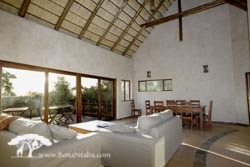 Linens and mozzy nets are supplied and windows have screening and coverings. 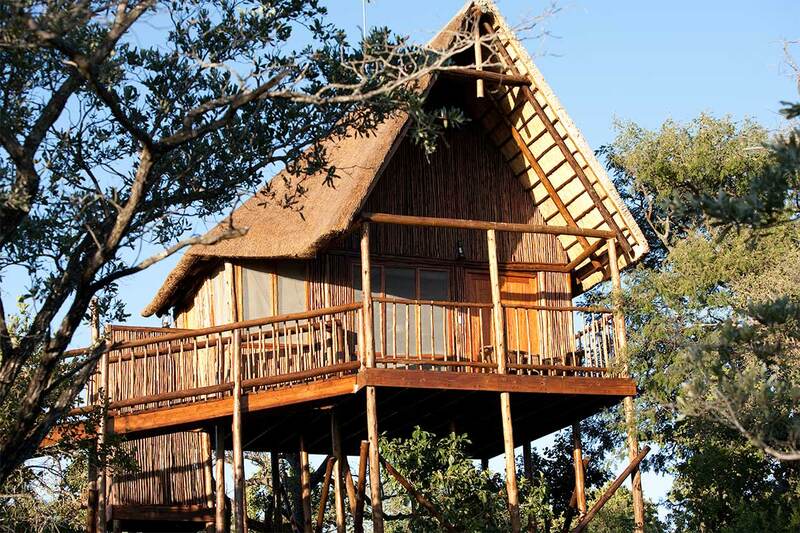 Each tree house has plenty of electrical point and a personal safe. 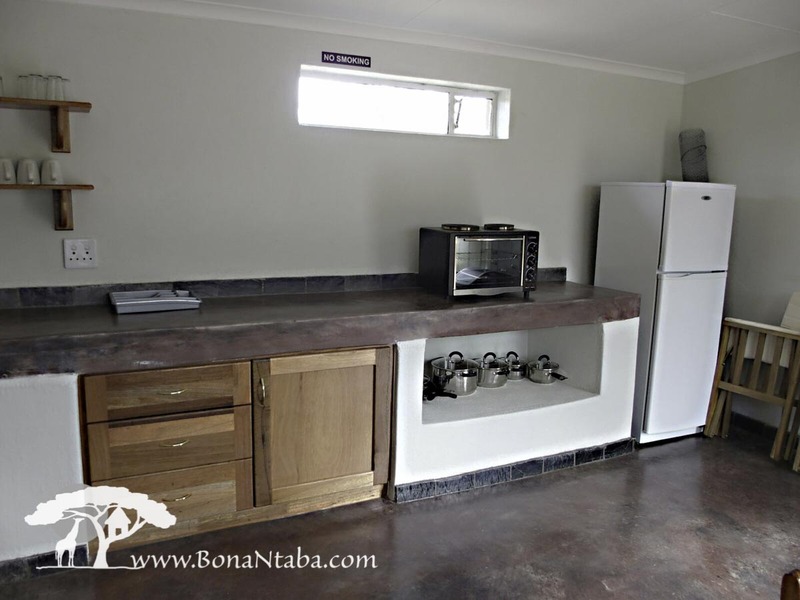 Guests will use the large kitchen in the lodge building with the Couples Tree House to do their cooking or braai in the boma. 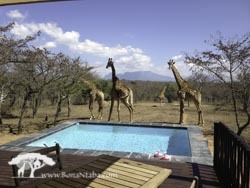 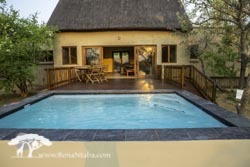 The lodge also has a dining area, lounge, deck with a view of the watering hole, and splash pool. 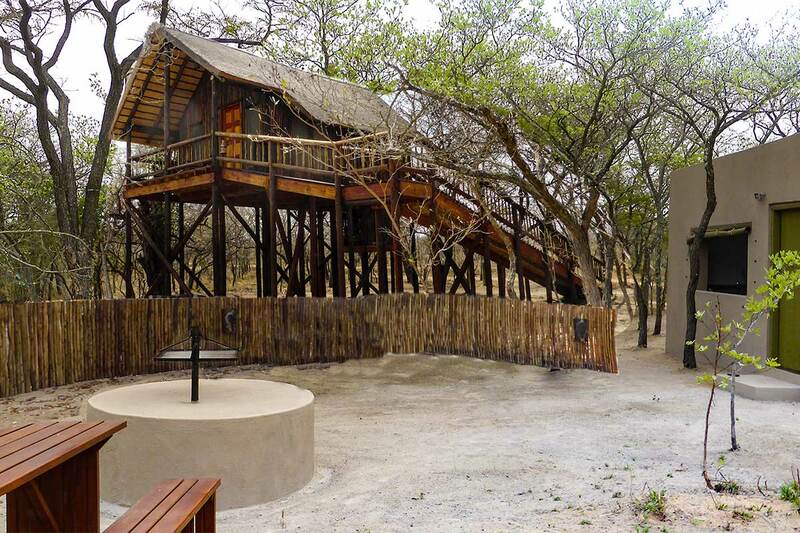 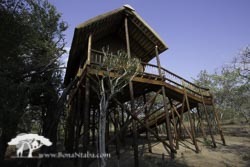 Our Couples Treehouse is similar to the Family Treehouse, but is the perfect size for a two. 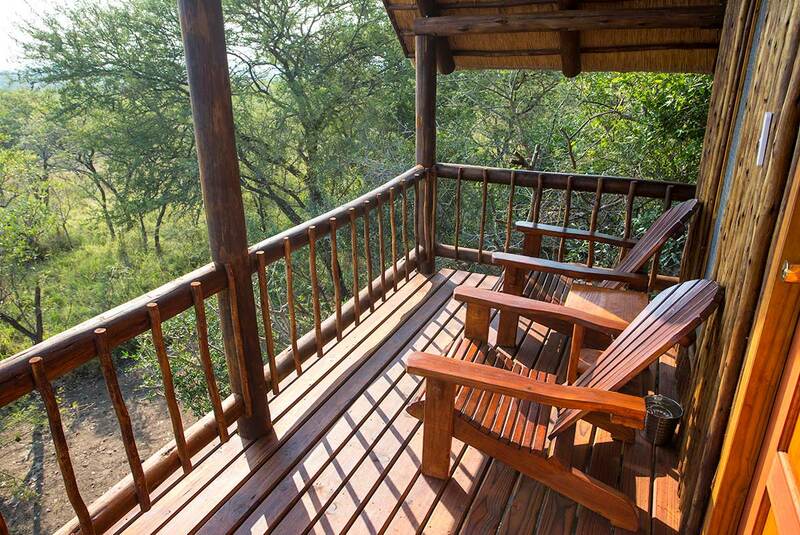 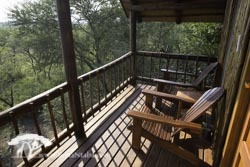 The private covered balcony has terrific views of the bush and mountains. 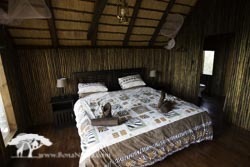 Inside are either two single beds or a king sized bed. Inside is an ensuit bath with tub, sink, and toilet inside and an outside shower. 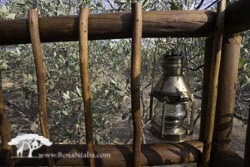 Linens and mozzy nets are supplied and windows have screening and coverings. 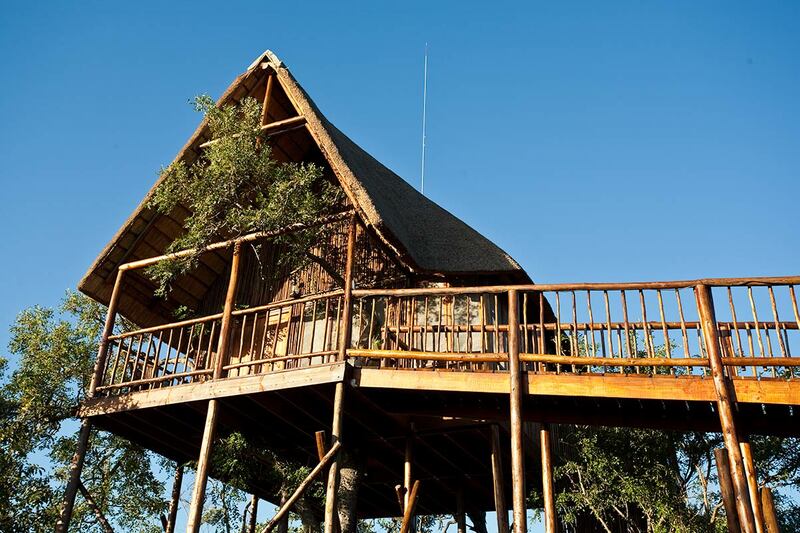 Each tree house has plenty of electrical point and a personal safe. 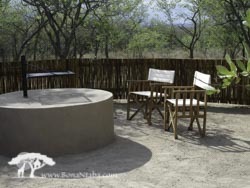 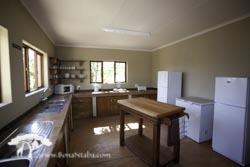 Guests will use the large kitchen in the lodge building to do their cooking or braai in the large boma. 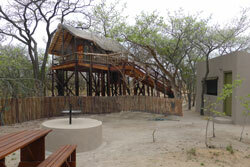 The lodge also has a dining area, lounge, deck with a view of the watering hole, and splash pool. 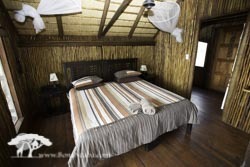 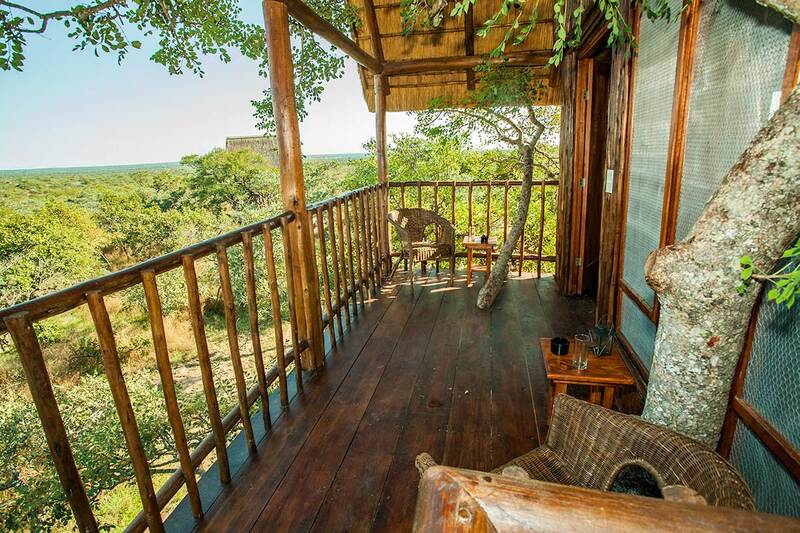 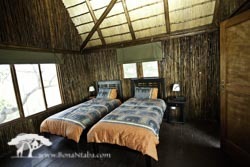 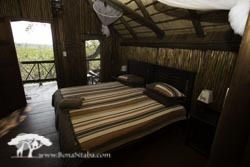 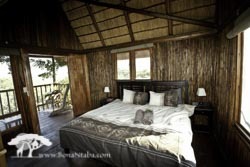 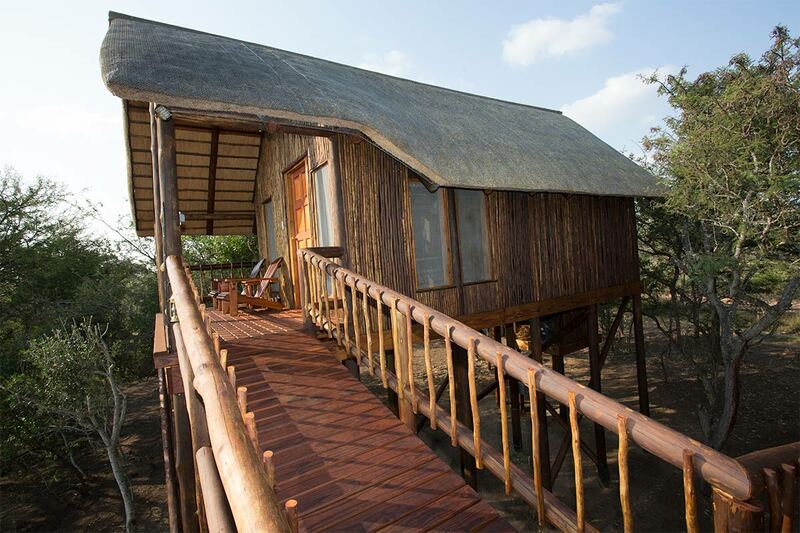 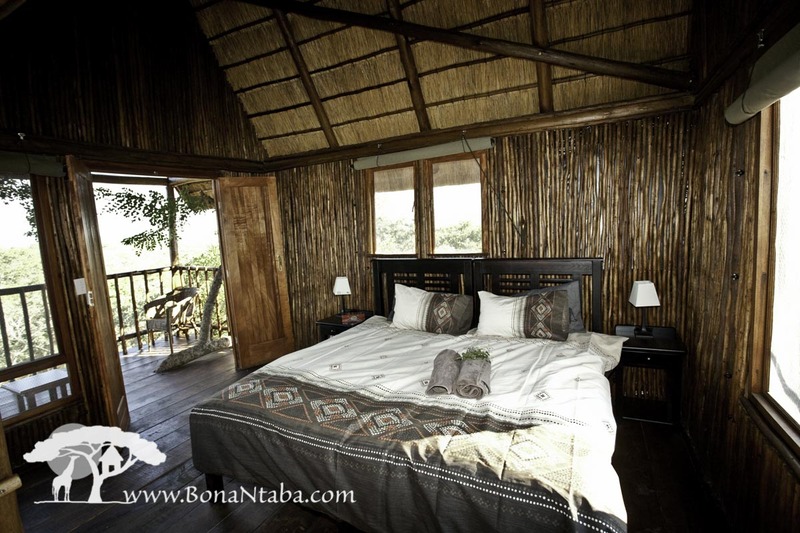 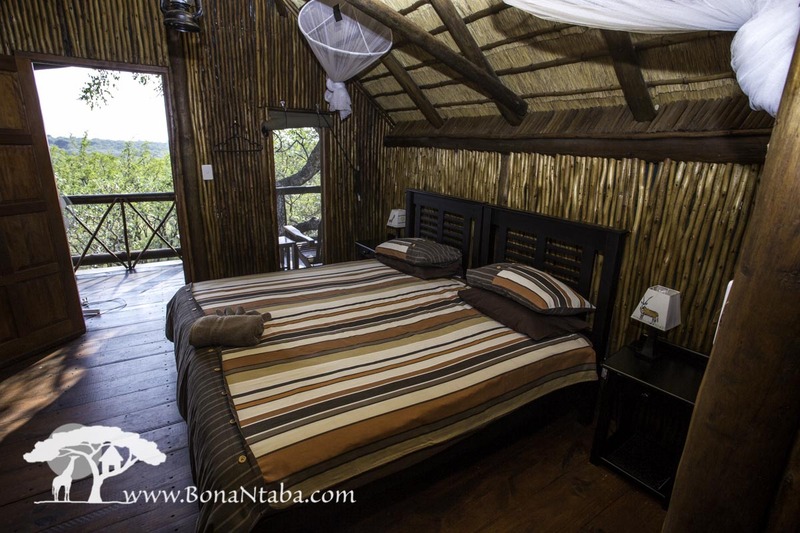 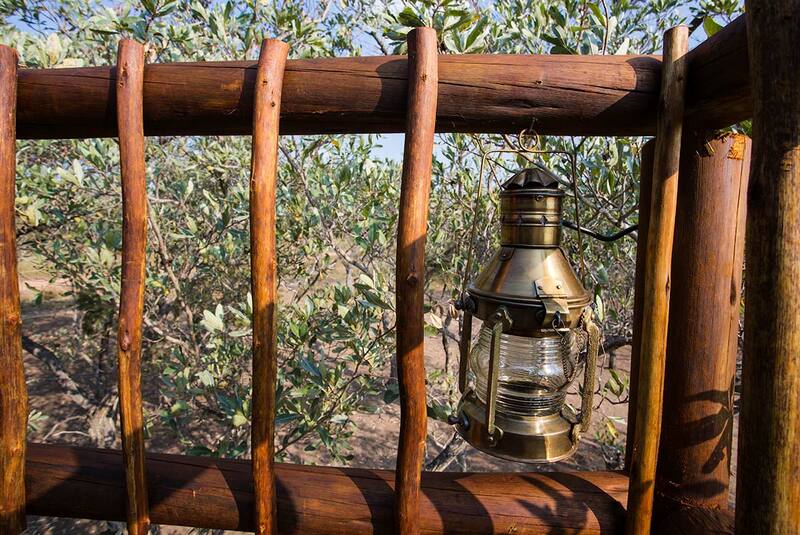 Our 2 Tree Houses with Private Kitchen & Boma have a 16sq meter kitchen building at the base of the tree house. 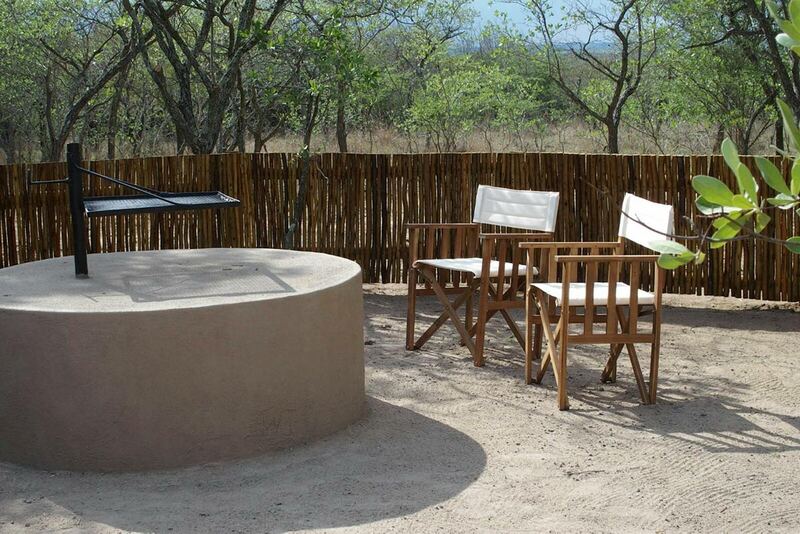 In front of the kitchen is a boma with braai and a mountain view. 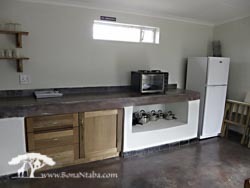 The kitchen features double sinks, burners, oven, microwave, table, full refrigerator, dishes, cooking pots, and utensils. 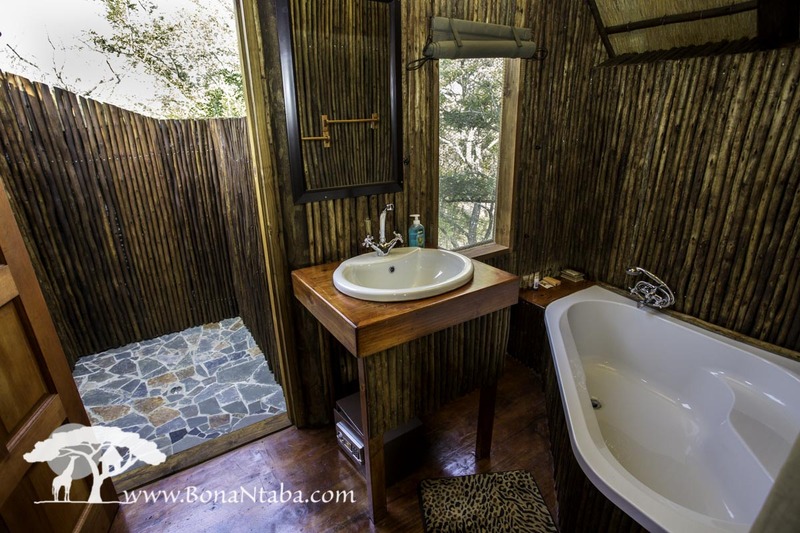 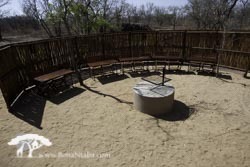 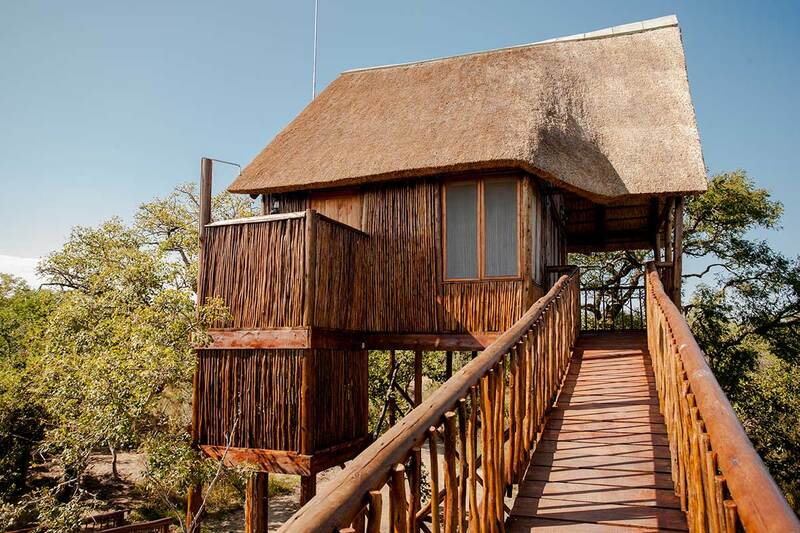 The tree house has an ensuite with tub, sink, and toilet inside and an outside shower with breathtaking views of the bush, mozzy nets, screens, and linens provided. 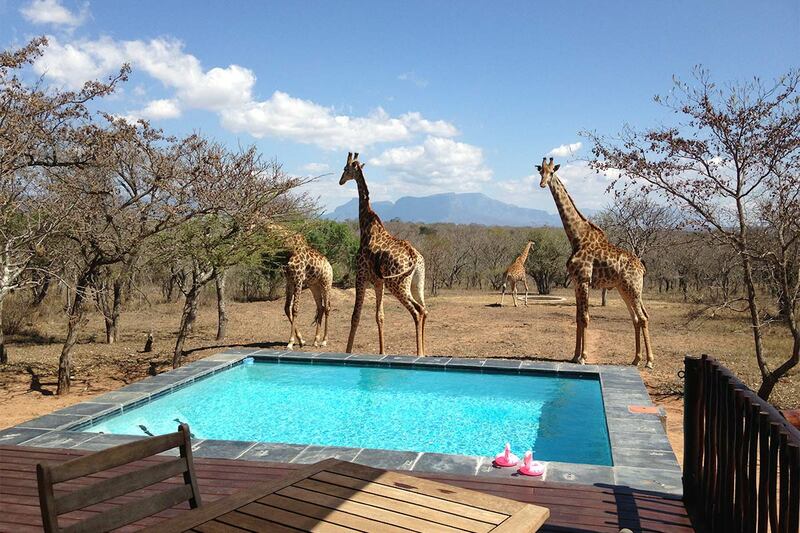 Units are serviced daily. 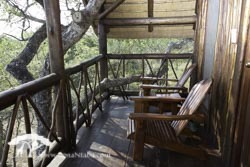 This tree house is placed away form the others and the lodge building for privacy and the feeling of being alone. 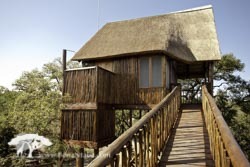 Enjoys views into the neighboring big 5 reserve as well as our own plains game as it wanders by. 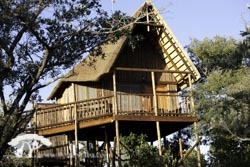 The tree house and kitchen are serviced daily. 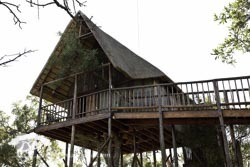 Our lodge building is where guests in our Family and Couples tree houses will find a large self-catering kitchen, lounge, deck, boma, and splash pool. 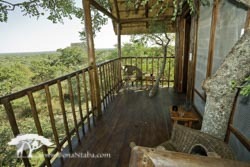 The lounge is a relaxing place to sit and read. 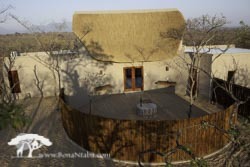 It has large windows looking out at the wildlife watering hole and a dining table for eating indoors. 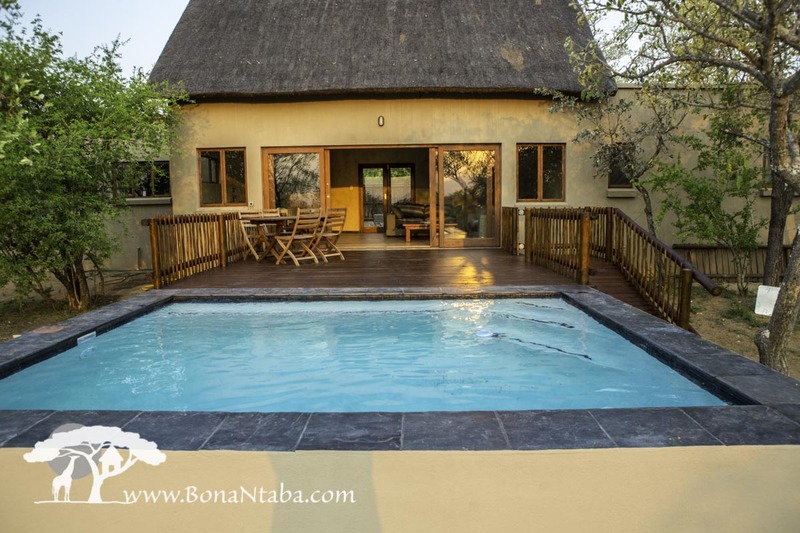 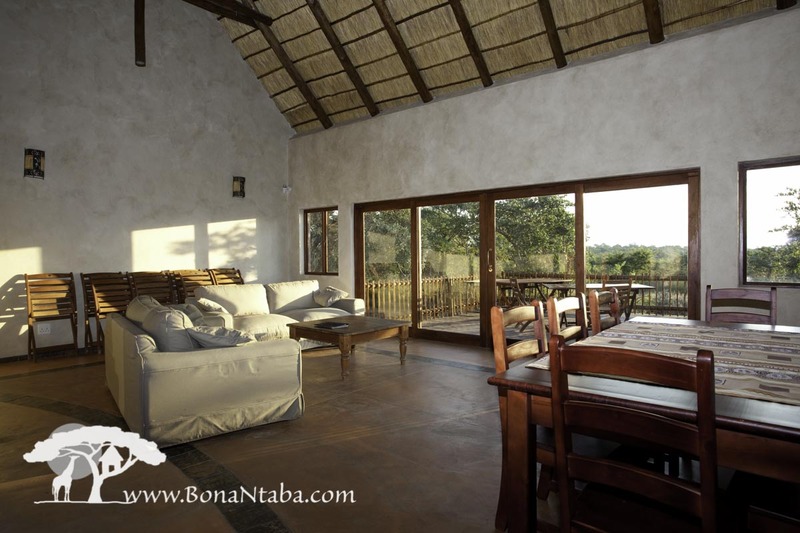 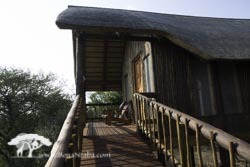 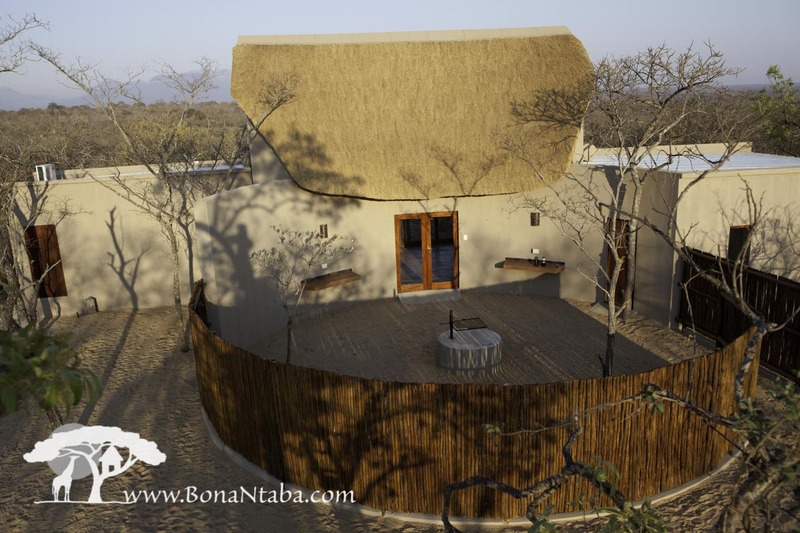 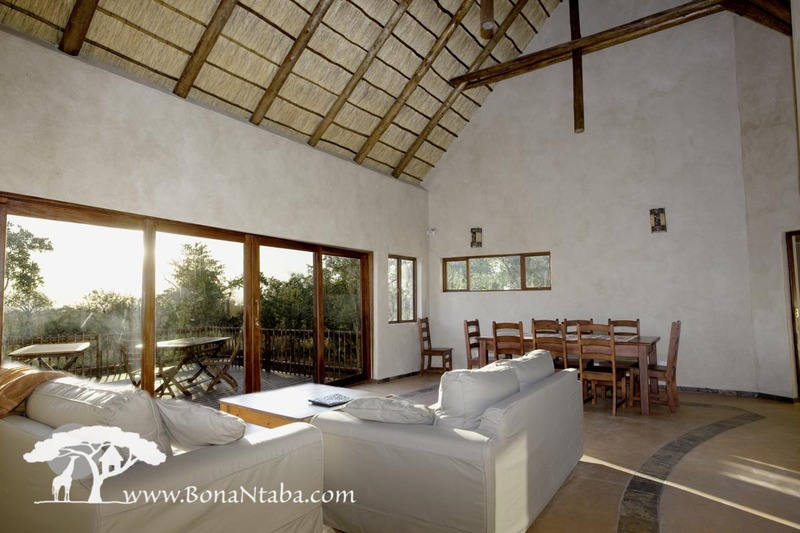 The boma is attached to the lounge and kitchen on one side and the sunset deck is on the other. 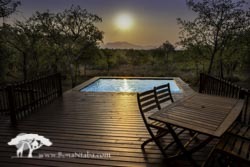 Enjoy a refreshing swim in the pool as you watch wildlife or the sunset. 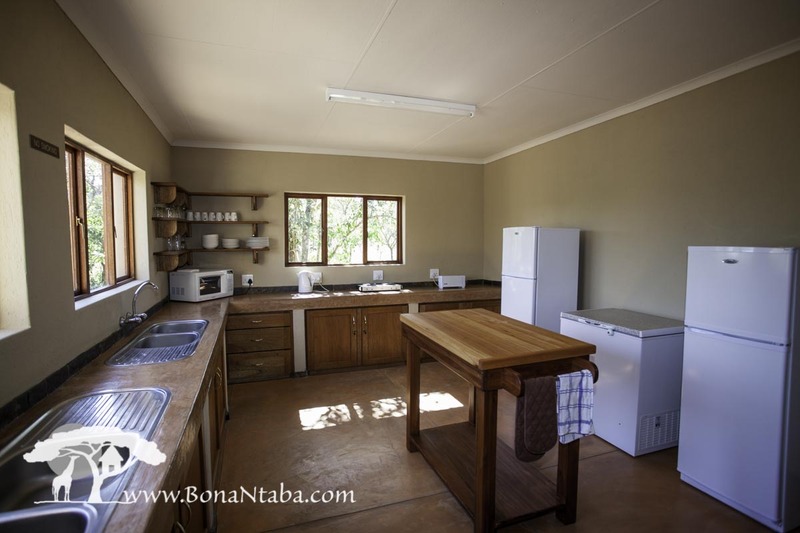 The large kitchen has all the dishes, pots, pans, and utensils you will need to do your cooking. 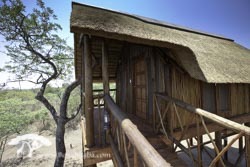 Each of the 2 tree houses will have their own refrigerator and locked cabinet in the kitchen. 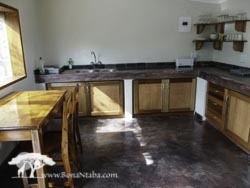 Two sets of double sinks, extra burners, and a full oven / stove make it easy for multiple people to cook at the same time. 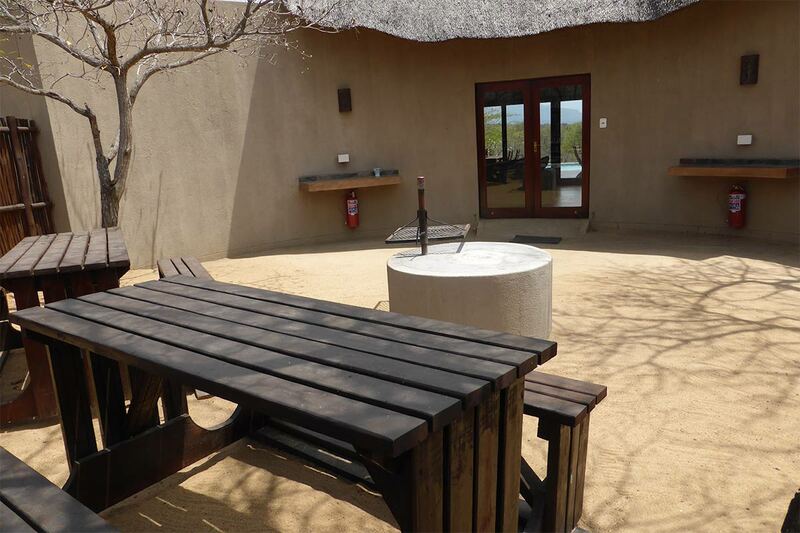 The braai just outside the kitchen for convenient dining and outdoor cooking.